Windows Timeline Support is a free browser extension for Chrome-based and Firefox-based web browsers that integrates the browsing history with Windows 10's Timeline feature. Microsoft introduced Timeline in Windows 10 version 1803 as a way for users to better keep track of activity on the system. Timeline was limited to some native apps like Microsoft Edge, News, Microsoft Office and some other built-in applications, and the situation has not really improved that much since the introduction. So, to activate Timeline you simply use Winodws-Tab to display its interface. Timeline displays activity chronologically and you can click on items to open websites again, load documents, or go back to where you were on that particular day. Windows 10 users who don't use Microsoft Edge for web browsing -- and not many do -- may have noticed that Timeline does not work with any third-party web browser. While that is not a problem if you don't use the feature, it may be if you do. 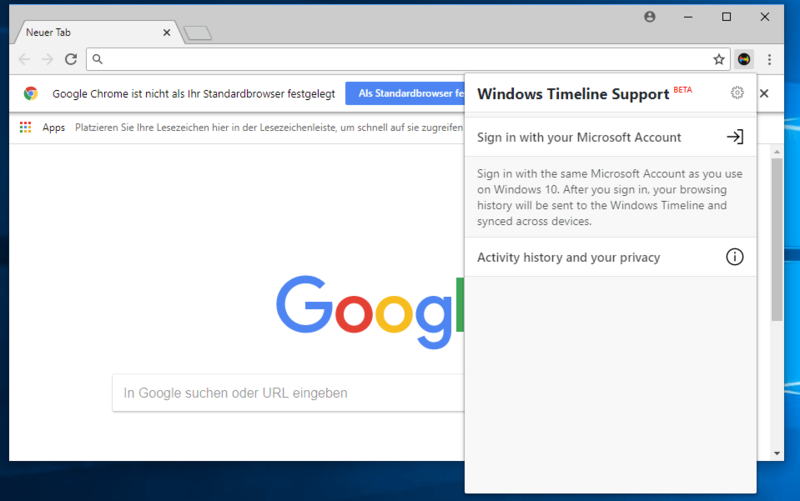 Windows Timeline Support for Chrome and Firefox, and compatible browsers like Vivaldi, changes that by integrating the browsing history of compatible browsers with Timeline on Windows 10. You do need Windows 10 version 1803 or later for this and the extension. Note that it is not enough to just install the extension and be done with it; it requires that you sign in to your Microsoft Account to sync the browsing data with the account and thus Windows 10. The browsing history is published as activities to the Microsoft Graph by the extension as the author explains on the project's GitHub website. Windows Timeline Support is a web extension that integrates Windows Timeline support into popular browsers. This is done by publishing your browsing history as activities to the Microsoft Graph (so a Microsoft Account is required to use this extension). Personal Microsoft Accounts are confirmed to work, work and school accounts should work. The very first thing you need to do therefore is to sign in to the Microsoft Account. Just click on the extension icon in the browser's interface and click on the sign in option. Follow the instructions to sign in and sync the browsing history with the selected account. The extension won't sync Incognito Mode or Private Browsing Mode data with the account. Users can open the Microsoft Activity History Dashboard at any time to delete and manage the data. The extension is open source which means that you can check out the source code before you install it. One interesting feature of Windows Timeline Support is that you can continue your browsing on other devices if you sign in to the same Microsoft Account. You can push the current tab to any device linked using the browser extension. You may find Windows Timeline Support useful if you do use Windows Timeline and Chrome, Firefox, or another third-party browser that the extension is compatible with. Now You: do you use Timeline or would use it if it would be available on your devices? maybe replace “users” with “Microsoft and whoever is interested in buying this data, advertisers, your e-commerce sites, your insurers, your bankers, your employers, the schools of your children, your stalkers, …, and don’t forget the police” … ? Unfortunately this timeline can only send me back in my browsing. Cool stuff would be a timeline that knows my future browsing. I mean, collecting for around 20 years my personal data, it should be an ease for Microsoft et al. to predict my next steps. I don’t understand what makes showing your complete browsing history on Timeline a good thing. It makes it a hell of a lot easier for others to snoop on your activity, especially if you don’t use incognito/private mode regularly. That is the entire point of Windows 10. Trick you into putting all your data into the MS cloud (where it resides in clear text) and track everything you do for their NSA masters. There is very little in Win10 that is an actual improvement for the user. The only thing so far that I have seen that I miss on win7 is the ability to change audio output device per application. That would be nice but not at the price of total loss of privacy and data security. Hi AxMi-24. What you ask can be done with VoiceMeeter Banana by VB-Audio. You have to route the audio into this advanced mixer and once set, you’re OK. Tutorials are on Vincent Burel site.